Can you do me a quick and easy favor? 15 years ago in 2001 I started making jewelry. It was a hobby at first, but people liked what I did and eventually 10 years ago in 2006, I opened my PhoenixFire Designs etsy shop. I continued to run my business part-time while also managing a normal day job. So with the support of my husband and a TON of fear and uncertainty, I decided to try and run my business for real as my only job. It’s been a ton of hard work but it’s been so rewarding. After over a year of recovery, I’m back to good health and I’m happy. Here’s the favor part. 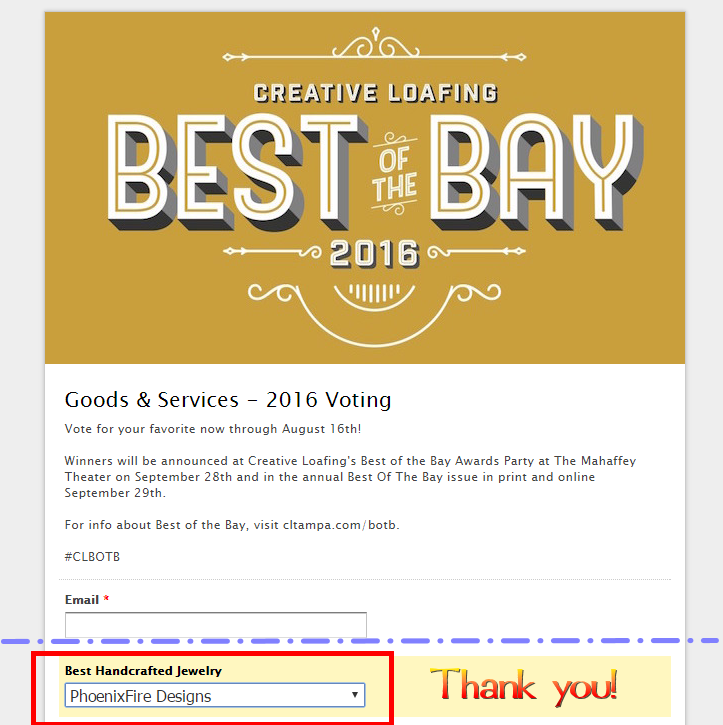 I got nominated for “Best Handcrafted Jewelry” in Tampa Bay. I would LOVE to win, especially given this year marks 10 years of my etsy shop and 5 years since my medical crisis. So can I get a vote? It’s just an email address (they don’t email you anything) and selecting “PhoenixFire Designs” under the “Best Handcrafted Jewelry” category. One vote per EMAIL address (not necessarily per person.) No prize money or anything but it would be an amazing honor to be able to say I won.